A nervous White House official tip-toes into the Oval Office where Donald Trump is watching Fox News. "Mister President" he says. "It has been confirmed that Hurricane Ellie is fast approaching. What should we do?" Without lifting an eye from the television, the answer is delivered: "Offer her the same deal as Stormy Daniels." That incident, with an emphasis on misunderstanding, didn’t happen. But in the Austrian city of Salzburg last Thursday there was a very real life political storm, rooted in conflicting interpretations. British Prime Minister Theresa May arrived from London, seemingly believing that she could pocket and depart with the basis of a perfect divorce from the European Union. The pain-free, responsibilities-free settlement expected by the likes of Boris Johnson, Jacob Rees Mogg, David Davies, Bernard Jenkin and pals is an arrangement that guarantees future access to the family home and resources, while the leaver pursues a new life, playing the field. If the requisite understanding is not displayed, the UK is heading off, anyway, and Europe can forget about direct debit guarantees and mortgage repayment arrangements. As a result of what Theresa May describes as an impasse, the island of Ireland (population 6.58 million, 1.3% of the 508 million EU total) is at the centre of an unprecedented row. And widening the lens, the core issue is Northern Ireland, population 1.811 million - 0.36% of the EU total and 2.7% of the UK total. If the Irish border is, as Boris Johnson describes it, a gnat, then it is a powerful gnat. Should the British government be surprised to find itself in this position? Two days before the Brexit referendum vote, one of its ministers saw the potential for trouble, as remarks made at that time outline. 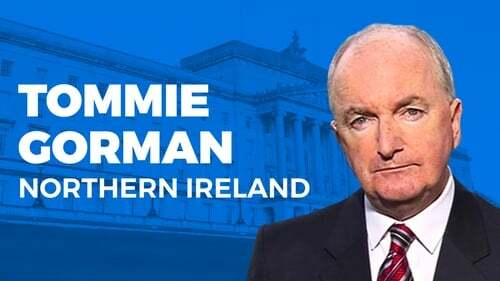 "Just think about it, if we are out of the European Union with tariffs on exporting goods into the EU, there would have to be something to recognise that, between the Northern Ireland and the Republic of Ireland. And if you pulled out of the EU and came out of free movement, then how could have a situation where there was an open border with a country that was in the EU and had access to free movement?" The person making those pertinent points, when visiting Northern Ireland on 21 June 2016, 27 months ago, was the then Home Secretary Theresa May. Leave politics and personalities aside for a brief moment and let mathematics explain the Good Friday or Belfast Agreement, overseen by the British and Irish governments in 1998. The graphic, from secondary school maths days, conveys intersecting sets. The red bit in the middle represents the citizens of Northern Ireland, all of them, for the first time entitled to an Irish passport, a British passport or both. They are also guaranteed, if at some future date the circumstances seemed to warrant it, a poll that would allow them to decide if they want to leave the UK and become part of a united Ireland. This intersecting sets arrangement was created within the wider structure, the rectangle, the European Union. The circle to the left represents Ireland and the one of the right is the UK. The problem now is the circle on the right wants to leave the rectangle and take with it the red intersecting area. The circle on the left is to be left behind, possibly without the red intersecting chunk. The arrangement of two intersecting sets, within the European Union framework, is about to be disrupted. Just like Joe Duffy’s Liveline on RTÉ Radio One does in Ireland, BBC TV’s Question Time, presented by David Dimbleby, and BBC Radio Four’s Any Questions, hosted by Jonathan Dimbleby, and the follow up Any Answers half-hour offer provide insight into what’s exercising UK citizens. During the months leading up to the UK’s Brexit Referendum Vote, the smoke signals coming from those BBC TV and radio programmes were ominous for Remain campaigners. The loudest and most sustained audience applause was usually in support of Brexiteers. Ireland, the nearest neighbour, source of what would be the only UK land border with the EU, rarely featured in the debate. On the few occasions it got a mention, the knowledge offered by the panellists wouldn’t fill a page of a Ladybird reader. But in recent months there has been a significant change in those Dimbleby-chaired BBC TV and radio programmes. There is now a consistent pattern of audience members asking questions about Brexit’s impact on Ireland. The Irish border puzzle was the main topic raised by callers and social messengers to the Any Answers BBC Radio 4 programme last Saturday afternoon. This is a shift because since the referendum, at political level in the UK, the Brexit strategy has remained the preserve of the competing factions of the Conservative party. They’ve had the pitch to themselves. Labour has morphed into a political version of The Moonies, a cult or a movement, possibly unelectable, with no coherent alternative strategy on how to address Brexit. The force in Theresa May’s ear, colouring her approach to negotiations with the EU, particularly Ireland-related issues, is the DUP. The election she herself called last year has left her government reliant on the support of ten DUP MPs to remain in power. She is entirely dependent on their backing for her survival and on regular occasions the DUP finds the circumstances to make sure the government understands their importance. The abstentionist basis on which they were elected to Westminster means the seven Sinn Féin Westminster MPs fly across to London every week, do their constituency work, draw salaries and expenses for redistribution by the party machine but refuse to take seats in the House of Commons of participate in debates and votes. Were they willing to do so, they would offer analysis of the Brexit challenge not provided by the government, its DUP partners or Labour. They would also be in high demand in radio and television studios within the Westminster bubble. It’s an opportunity that the likes of Alliance party leader, Naomi Long or the SDLP’s Mark Durkan, Alasdair McDonnell or Margaret Richie would embrace with delight. But they lost their seats so Westminster presentation of the Northern Ireland case is left to the DUP, Independent Unionist, Sylvia Hermon and the missing Sinn Féin seven. Absolute objection to the notion of any checks being carried out in the Irish Sea and treating Northern Ireland as a place different than the rest of the United Kingdom is a red line matter for the DUP. And for Theresa May. But in reality, "difference", indeed Northern Ireland's "uniqueness" has, on many levels, been a significant, ever present factor in recent years. As the Brexit referendum campaign came to the boil two years ago, more than £400,000 from not fully known sources, was dispatched across the Irish Sea to the DUP. It has its headquarters in Northern Ireland, where due to the danger factor during The Troubles, political donations do not have to made public. Almost £300,000 was then sent back across the Irish Sea and used to finance a four-page wraparound, promoting Vote Leave, distributed to hundreds of thousands of commuters in England and Scotland but not in Northern Ireland. Northern Ireland is "different" when, unlike any other region of the United Kingdom, its representatives are welcomed to Washington, the White House and Capitol Hill every St Patrick’s Day. That tradition has survived the uncertainties that characterise the Trump presidency because of the universal relief that the killing has stopped in Ireland. Northern Ireland sought to make itself "different" from the rest of the United Kingdom when, with one voice, its politicians lobbied the British government to allow it introduce a special Northern Ireland rate of Corporation Tax, to compete with the 12.5% per cent rate, used over the border to great effect. Professor Pete Shirlow, Director of Irish Studies at the University of Liverpool, sees Brexit as an opportunity for Northern Ireland to make hay from its uniqueness. "Could it be a potential bonanza?" he asked on yesterday’s BBC Northern Ireland Sunday Politics Show. "Could it bring investors to Northern Ireland who want to pick up on its peculiar status within the UK? Having Northern Ireland in some different type of arrangement than the rest of the UK does not diminish our Britishness in any way. If anything it could create an economic bonanza." The practical outworking of Peter Shirlow’s thesis is worth considering. Multinational companies, considering Northern Ireland as an investment location, could easily opt for Liverpool, Glasgow, Norwich or Bristol if access to the UK market was their priority. The possibility of being in part of the post-Brexit United Kingdom, with access to the European Union, is a completely different proposition. A leader, lacking power and support, cuts a lonely figure. Theresa May is in that zone, as the Conservatives’ annual conference approaches. The DUP’s ten Westminster MP’s are in a different place, not just the dominant force within their own party, but with the greatest influence over a British government since Ian Paisley founded the DUP in 1971. But centre stage brings responsibilities. And pitfalls. Theresa May’s "I will not break up my country" speech in Downing Street on Friday included the following lines. "We will set out our alternative that preserves the integrity of the UK. And it will be in line with the commitments we made back in December, including the commitment that no new regulatory barriers should be created between Northern Ireland and the rest of the UK unless the Northern Ireland Executive and Assembly agree." The inclusion of that sentence – no new regulatory barriers unless the Northern Ireland Executive and Assembly agree – echoes what was sought by the British government, on foot of an intervention by the DUP when negotiations ran into trouble in December 2017. The practical implications are profound. If the 90-member Stormont Assembly re-opened in the morning, pro-remain parties have the numbers to outvote the DUP. A combination of Sinn Féin (27), the SDLP (12), Alliance (8), the Green party (2) and People Before Profit (1) would have a comfortable majority, even if all the Ulster Unionists (10) and Independent Jim Allister (1) sided with the DUP (27). If as part of their desire to keep Northern Ireland within the customs union, or indeed the EU, the pro-remain parties supported regulatory barriers between the UK and Northern Ireland, the only blocking mechanism available to the DUP is the often criticised ‘petition of concern’ measure - the majority of nationalists and majority of unionists stipulation. The UK’s Brexit decision was made on a 52% to 48% majority basis: the Stormont Assembly and Executive serves a region where 56% of voters sought to remain in the European Union: the DUP could find itself using the shelter of a Good Friday Agreement provision to uphold its minority position on Brexit-related matters. If that’s the basis on which Brexit-related business would be done or not done in a revived Stormont Assembly, there is no possibility of power-sharing returning any time soon. Brexit has the capacity to keep the Assembly closed indefinitely. The Labour Party annual conference is under way in Liverpool. On Tuesday, Arlene Foster will give evidence for a final time to the so called cash-for-ash public inquiry at Stormont and her performance will be closely monitored. Next week, Theresa May will address the Conservative party’s annual gathering. Then comes the Brussels Summit of EU leaders on 18 October. Is there such a thing as a perfect, everybody wins separation? In July 1947, as the British prepared to pull out of India, Cyril Radcliffe was the hapless law graduate dispatched to map out the border between two independent states, India and Pakistan. In the chaos and migration that followed as many as 15 million people were uprooted and between 200,000 and two million were killed. Radcliffe, who had never before been to India, was given less than six weeks to complete his work. He was so overcome by its consequences that he refused to take his salary. The French exit from Algeria in 1962 was troubled. Belgium has very mixed memories over its extrication from the Congo. No member state has ever before cut its ties with the European Union. Ireland, south and north, remain the most obvious candidates to feel the consequences of any Brexit aftershocks. That’s likely to be the case Leo Varadkar keeps making as one among 27 about this, to date, problem with no obvious solution. A problem not of his making.